Where does food come from? That’s the question that first grade students at Fairgrieve Elementary School spent some time talking about during Ag Literacy Week. Lynne Field’s first grade class at Fairgrieve Elementary School listen to Ag Literacy Week volunteer Erica Schreiner read them the story “Who Grew My Soup” by Tom Darbyshire. Cornell Cooperative Extension of Oswego County coordinated Ag Literacy Week activities at the school as a way to get students thinking about where their food comes and what food is grown and harvested in Oswego County. 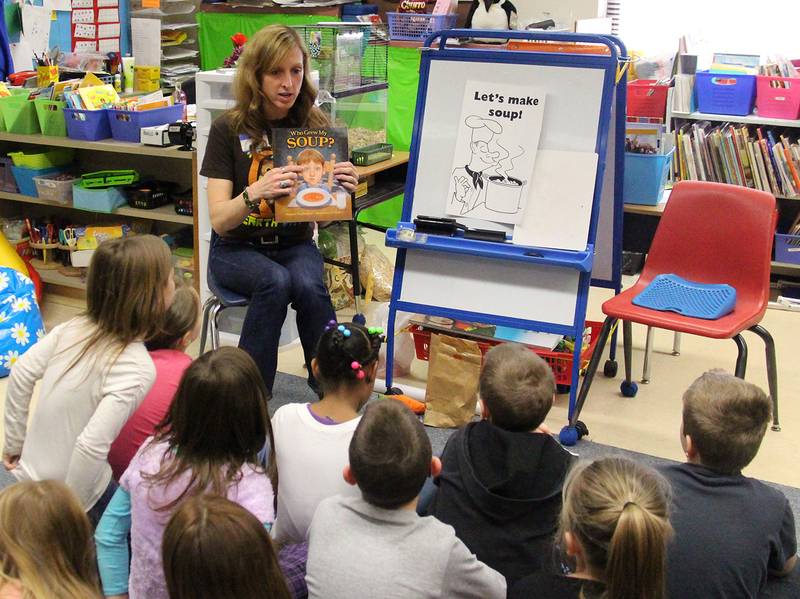 Erica Schreiner, a volunteer coordinator through Cornell Cooperative Extension of Oswego County, stopped at the school during the state-wide literacy campaign to read to students the book “Who Grew My Soup” by Tom Darbyshire. The students munched and crunched on healthy carrot snacks and she talked to the classes about eating healthy and then played a ‘Let’s Make Soup” game where she got the students thinking about where their food comes from and what items are grown and harvested in Oswego County. 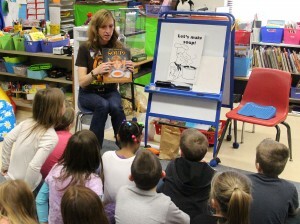 Ag Literacy Week is a New York State Agriculture in the Classroom initiative that was celebrated the week of March 17 – 21. Cornell Cooperative Extension of Oswego County coordinates the educational outreach program for the Fulton City School District, organizing a literacy volunteer to stop by classrooms for a visit and discussion about the importance of agriculture. As part of the Ag Literacy Week program the Fairgrieve Elementary School Library receives a free copy of the program’s featured book to keep in circulation for the students to sign out at their leisure.